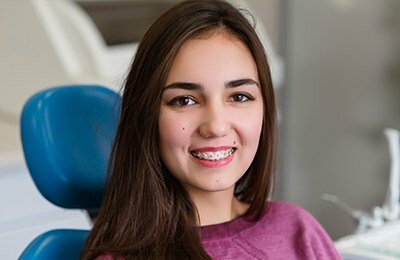 Braces are considered a rite of passage for many young people, much like getting your driver's license. Sometimes, clear brackets and tooth-colored wires can help hide the hardware. Our in-house orthodontist will help you explore the options and discuss if braces fit your treatment scenario. While orthodontics can solve many tooth alignment problems, successful treatment relies on good patient compliance. Wearing elastic bands consistently, keeping follow-up appointments for adjustments, and practicing outstanding home care can all help lead to a positive outcome. This commitment involves frequent preventive visits with your hygienist, which will help you avoid cavities around the brackets. The ProSmiles Dental & Orthodontics team specializes in helping our orthodontic patients through this process so they can enjoy a gorgeous, healthy smile once the treatment process is complete.